Thankful and grateful to be invited to the 2019 Florida Folk Festival again in 2019. Times & stages TBA--I'll put them up as soon as they are announced. Details to be announced as they come--but will be playing the rainbow concert with the Irish Music Ensemble. Going to join my friend, John Warren of Cashiers NC for a short mountain music & banjo demo for the after school mountain music program at the Glenville/Cashiers School. Hope to inspire some of the girls to take up banjo. Bob & I will have a vending table with all my new books and CDs available at the Unicoi dulcimer festival. We'll be jamming in the main room too --so stop by to see us. Also--I may have a couple of my dulcimers for sale behind the counter & I can take your credit card on my phone. Lady With the Checkered Past --Ron Cook Tennesse box style with wood checkered back & light case. One of a kind Collectors item $1500--credit card or paypal or $1400 cash. If you know you want this dulcimer--email me in advance & I'll have it ready for you on Thursday evening so someone else won't beat you to it. Day & Night Dulcimer--fancy wood intarsia dulcimer crafted by Paul Conrad. Beautiful warm tone--no case--but Lee Felt will be vending so you can probably get a nice case for it. $1000 by paypal or credit card--$900 cash. Its being edited and mixed now & mastered this year and is coming in 2019. This is the 20th anniversary CD of my first recorded Cd--Vintage Banjo in 1999 & my old Gibson banjo has been tuned up & neck reset to play banjo/fiddle duets on the new cd ! and I'm very excited for you to hear the award winning fiddle & guitar & bass of Tim Gardner, the harmony vocals of Cindy Carpenter & the mandolin & guitar of Darren Nicholosn. Lots of fun picking with the Monday night old time jam pickers in the community showcase at the Brevard Halloween festival in downtown Brevard, NC. Please join mountain dulcimer whizzkid & recording artist, Mary Z Cox, for an Evening of Dulcimer & Beyond. Mary Z will be bringing several of her rare & custom dulcimers including the “Lady With A Checkered Past” for tunes and songs & of course there will be banjo too. Mary Z's a 1st place Florida mountain dulcimer champion, won 1st place 4 times @ the Brevard, NC Old Time Championships & 1st & 2nd at the Uncle Dave Macon Days in Tennessee & 2nd at the Tennessee Valley Fiddlers Convention. Mary Z ‘s “Easy String Band Method For the Mountain Dulcimer” instruction book & CD has been a favorite with dulcimer students all over the world & many of her cds have mountain dulcimer selections. Her dulcimer articles, tabs, & mp3s have been published in the Dulcimer Player News. She has taught mountain dulcimer workshops at the Lagniappe dulcimer Fete, Suwannee Dulcimer Retreat, Fall NGFDA Festival at Unicoi, Florida Folk Festival, the Will McLean Festival, Wood n Strings in Townsend,Tenn, and in Big Timber, MT, Birmingham, Al, Charlotte, NC, Denver, NC & Charleston SC. Tim Gardner (fiddle) & I (banjo) will be playing music at Arcy & Satoko's wedding. Bob is going to be playing a tune or two too. Returning to Cashiers on July 12, 2018--more details TBA soon--but you know there's always gonna be banjos & a whole lot of fun. Sunday, June 10th, 2018 starting at 3:00 PM and ending at 5:00 PM EDT. Going to be picking banjo with my old pickin buddies--John Warren & CW. We are playing lots of string band tunes--fast & slow & yes--there will be plenty of DOUBLE BANJO! Here is when & where to hear me. 3pm Jam tent --mountain dulcimer jam--please come tuned in DAD and we'll play some string band tunes. Please join two time Florida & North Carolina banjo champion & recording artist, Mary Z Cox for an evening of mountain music & beyond with panhandle recording artist, guitarist & mandolinist, Ellen Scruggs Sheppard. Besides traditional & untraditional picking there will be sweet & sour harmony vocals, fast fiddle tunes, blues, Celtic, bluegrass and did I mention THERE WILL BE BARITONE BANJO ! Ellen has recorded her dancing mandolin and solid guitar on 3 of Mary Z’s CDs: Florida Banjo, Banjo Dreamin’ Suwannee Nights & Girl With the Banjo Tattoo & they will be playing and singing some tunes from them and also tunes from Mary Z’s latest CD, Good Morning Banjo, which was played last summer on NPR’s Thistle & Shamrock. Mary Z & Ellen have played and sung traditional music together since they were girls and won an award in the Tennessee Valley Fiddlers Convention for their old time singing version of “The Cuckoo.” This was a big contest which attracted professional musicians from Nashville. They will be kicking off this tune near the beginning of the 1st set. Please come by 8 pm to hear it. This is going to be a really fun evening at the Blue Tavern & hope you will come and join us in the camaraderie of live picking & song. “Fridays at Noon” offers bi-monthly lunch concerts that feature regional and national performing artists. A complimentary lunch is provided. Mary Z. Cox is a two-time Florida and North Carolina banjo champion who recently released her 10th recording “Good Morning Banjo” with North Carolina fiddler, Tom Gardner. Cox is also an award-winning dulcimer player and has taught many dulcimer workshops at the Suwanee Dulcimer Retreat, the Florida Folk Festival and has taught many dulcimer workshops. Admission is free with a reception with the artist to follow. Playing tonight with the FSU Irish Music Ensemble at the Club Down Under on the FSU campus. Tickets: $18-45. Optional preshow dinner package available, catered by Carrie Ann and Company. We have tickets for the George Benson concert this evening--so will not be booking concerts for myself on this date. But I will be playing at the Monticello Opera House on February 17th--so please come--its going to be fun :) And there will be banjos! FSU Irish Music ensemble will be playing with the Paul Brock Band (Ireland). More info TBA--but this is gonna be a very fun 2 day musical festival in Tallahassee & we are looking forward to playing for this fine audience. Please join two time Florida & North Carolina banjo champion for an Evening of Banjos & Beyond at New Posh Listening Room for a fun and up close acoustic house performance. Please call or email Debbie Dix for the details and to reserve your seat. And did I mention--the big growling cello banjo is coming too ? Thank you High Springs, Florida for inviting me to play at the 4th Folk In the Springs Festival. I'll be near the Great OutdoorS Shop playing from 5-6pm. This looks like a lot of fun --more TBA in the summer. Heading to Montana second weekend in August in 2017--I've been booked for a workshop weekend & concert--details TBA --but this will be fun with lots of dulcimer & banjo too. Please join two time Florida & North Carolina banjo champion and award winning mountain dulcimerist for an evening of Banjo, Dulcimer & Beyond when she brings her mountain music gone coastal to the fine folks of Birmingham Alabama. Please join us for an Evening Of Banjo, Fiddle & Beyond with Mary Z Cox & Tim Gardner. There will be blues, bluegrass, award winning banjo & fiddle, vocals, mountain dulcimer, cello banjo & did I mention there will be Banjo ? Two time Florida & North Carolina Banjo Champion & Award winning NC fiddler, Tim Gardener will be kicking off the 15th season of the Cradle Of Forestry's Songcatcher Series on July 2, 2017. The Florida Folk Festival is Memorial Day Weekend--May 26-28. It is a wonderful event focusing on the music, culture & history of Florida. Hope you can come--its going to be very fun ! Please welcome 2 time Florida & NC Banjo Champion & Florida, North Carolina & Tennessee Mountain Dulcimer Champion, Mary Z Cox to the 2017 Florida Folk Festival. MaryZ has played banjo since she was 12 & has recorded since 1999. She was recently video interviewed in Smithsonian Folkways “Conversations With Old Time Performers” and is the only banjoist in the series featuring the folk banjo music & culture of Old Florida & 21st century Florida. Mary Z ‘s photo & music is featured in October in the 2017 Banjo Babes Calendar)CD compilation & was the May Banjo Babe in 2016. She has recorded 10 cds and 10 instruction books & her newest CD & tab book, “Good Morning Banjo” are available at this festival. Her music’s been played on National Public Radio’s “Thistle & Shamrock,” “All Songs Considred,” Pandora World Music Genome, & the BBC. She’s taught clawhammer banjo for over a decade at the John C. Campbell Folk School as well as camps and festivals nationwide, including the Florida Folk Festival , and the Earl Scruggs Center in Shelby, NC. Mary Z has traveling around the world with a banjo on her back and brought American banjo tunes to the Osaka Ferry terminal, Shanghai Ferry, Shanghai Conservatory Of Music, Mongolian dining car on the TransSiberian Railway, Vancouver, BC, Dutch Harbour, UnAlaska, Abby Road in London & on deck on the Queen Mary II in the harbor with the Statue of Liberty. Its going to be a good evening too--with banjo, fiddle and so much more. (yep--even the big banjo cello) Award winning fiddler, Tim Gardner will be traveling from NC to play with Mary Z & its going to be great fun. Mary Z's 10 th CD--Good Moring Banjo will be debuting at the Blue Tavern that night and Mary Z & Tim will be playing many tunes and songs from the new cd as well as many songs & tunes old and new. 1458 South Monroe in Tallahassee. FSU Irish Music Ensemble's end of the term recital at Finnegan's Pub in Tallahassee. More info TBA as it arrives. Details TBA soon. I'll be playing with the FSU Irish Music Ensemble :) in the world music rainbow concert. This is a live music & dinner at the Monticello Opera House. Evening of Banjo & Fiddle & more with Mary Z Cox & Tim Gardner. This is gonna be great fun with Mountain Music Gone Coastal & Beyond. ---And did I mention ? THERE WILL BE BANJO ! FSU Irish Music Ensemble end of semester session/concert. This is a very fun group--please put it on your calendar if you love Celtic music ! More details soon--but this fall I'm part of the FSU Irish Music Ensemble performance class in the World Music Department. This will be our very first live concert and we will be the front band for an Irish Band that is touring from Ireland. rehearsing & recording much of this week - 9:00 Am-? Going to be trying out some new banjo/fiddle tunes, cello banjo/ fiddle tunes & more the week of October 17-21st in Tim Gardner's Coyote Ridge Studio. Hey--gonna be taking classes from Kathy Mattea & Janis Ian--2 of my heros! This is on my calendar because I can't book anything else at this time :) July 24-- 30but I will still be in NC then. Mary Z. Cox, two time Florida & North Carolina banjo champion, and Mountain dulcimer champion will perform in concert. at St. Peters By-the-Lake, Denver, NC Wednesday, July 13 at 7p.m. An open jam will follow the concert. Mary’s concert featuring banjo and also mountain dulcimer and the jam are open to the public. Concert general admission tickets are $15. for adults, well behaved children are free. Contact Cynthia Jones soon at mjones3244@aol.com or 704-483-0653 for ticket purchase. Tickets are prepaid and will be picked up at will-call the evening of the concert.There is limited seating available. Mary Z has taught claw hammer banjo for over a decade at the John C. Campbell Folk School in North Carolina. She is also a Florida mountain dulcimer champion, as well as a four-time champion at the Transylvania (NC) Old Time Music Competition. Craig Evans, videographer and interviewer for the DVD series, says she was included in this historical project because of her prolific recordings and instruction books & energetic hands on instruction, which have helped thousands of folks around the world, become better banjoists and musicians. Mary Z. Cox, is a third generation Floridian originally from Brevard County, Florida where her paternal grandparents were early settlers of the Indian River Catholic Colony. Her maternal granddad, a professional banjoist from St. Joe Missouri, inspired her early interest in the banjo. She records cds, plays concerts & festivals, gives workshops, and authors banjo & dulcimer instruction books. Her music has been played on National Public Radio’s, “Thistle & Shamrock”, “All Songs Considered,” Pandora World Music Genome, & the BBC. Two time Florida Banjo champion & Brevard, NC Old Time Banjo Champion & recording artist, Mary Z Cox will be returning to the Cashiers Community Library in 2016 with an evening of unique banjos and tunes of North Carolina, West Virginia, Florida and more. Cox Family Fourth of July private party. July 3-4th. Playing original & traditional Florida tunes @ the River Gazebo Stage @ 2:00 pm. Don't be late--25 minute sets :) And there will be banjo ! Florida Folk Festival is May 27-29 in 2016 this year. Always wonderful music, dancing, food, cultural exhibits from all over Florida. Coming soon! New Duo--Sugar Hill-- Mountain Music Gone Coastal --Mary Z. Cox & Kyle Willard--Acoustic banjos, guitar, uke, harmonica & vocals & old time string band, blues, bluegrass, traditional & modern folk--progressive celtic and clawhammer instrumentals & originals --and Jim hosting & rockin' out the bass! This is gonna be really fun--hope you can come ! Mary Z & Yazid are back together again for some innovative progressive banjo and African Carribean drumming. And--would you believe that since you saw us together last--our CD has been played on NPR's "Thistle & Shamrock " twice ? Award winning banjoist & recording artist, Mary Z. Cox teams up with guitarist, Justin Lindley for some Mountain Music Gone Coastal (folkgrass/bluegrass/americana/blues/celtic) as part of Tallahassee Music Week. I'll be playing with the FSU Old Time Ensemble for this spectacular concert. More details TBA --you may need advance tickets for this. This is a fine listening room but limited seating--so please email or call Debbie Dix for reserve a seat or two. Lots of fiddle, banjo, guitars, mando, bass, singing & dancing. More details TBA--this may or may not be open to the public--will post about this as soon as I know. Going 2 b a fun lab session with mountain music gone coastal--And--THERE WILL BE BANJO ! Mary Z will be gone from Tallahassee in Sept/Oct 2015. She & her college roommate, Lin Hutton will strike out by land & sea for Japan. We leave Charlottesville, VA on September 6, Vancouver, BC on September 11 across the top of the world to Shanghai where we will jump ship in Tokyo where Arcy will meet us, then to Kobe and in Japan a week, then the Shanghai Ferry on Sept 29 (and we are thinking LED light dancing on deck) then Bejing, then transsiberian to Moscow & there's gonna be some Budapest & we got to be in Southhampton by October 22 to catch the Queen Mary 2 back to NYC. by Halloween. But--sure to be home by November--but we've already bought our tickets over and back--so won't be scheduling anything in Florida during those months. Here's the link for the Songcatcher series. Another fun banjo evening at the Cashiers Library--more details coming soon. Got the news today that we will be playing at the Florida Folk Festival on Memorial Day weekend. The 2015 Florida Folk Festival will be May 22-24, 2015. House concert at New Posh. Details coming soon--but it will be fun. 10am-noon $20 advance sign up at the store--$25 the same day. MaryZ won 1st place in the old time banjo contest in Brevard, NC last year & this year playing Snowdrop in 35 degree weather outdoors , but you'll get to hear it indoors. Advanced tickets for the the concert & dinner are up now and you can get them online here . See & hear special banjos from the private collection of two time Florida banjo champion & recording artist, Mary Z. Cox when she brings her banjos to the Monticello Opera House. Hear a cello banjo, John Bowlin 1865 fretless banjo, John Hartford banjo, mermaid banjo & Jim Crozier will be joining Mary Z for banjo/bass duets and ukulele madless & Lisa Lorenzo will be adding some sweet vocal harmonies. Hope you join us for this special evening of music and fun—and—THERE WILL BE BANJOS . Private family party in Cashiers from April 10-12th. Mary Z Cox & Jim Crozier play banjo/bass duet instrumentals & favorite soft vocals at the Miccosukee Root Cellar. Tasty organic dinners & yummy music too. Mary Z Cox & Blue Sky Banjo in the Carrilon Tower sometime between 9-4 pm--Times TBA. Lots of good music & performers during the day. TBA--but Craig Evans is coming to Florida to interview Mark Johnson, Mac Benford & me. :) So excited ! Picking a little banjo on the back porch of the gift store at the Stephen Foster State park on Saturday for Primitive Arts Day. Two time Florida Banjo Champion and recording artist, Mary Z. Cox , with Jim Crozier, bring banjo, guitar, uke, bass and vocals to the Skyline on Friday, December 19th. There will be West Virginia tunes, North Carolina tunes, Florida tunes, blues, banjo/ bass duets, songs of heartbreak, love and anti-love, ancient winter carols, and THERE WILL BE BANJOS ! Fun picking & camping weekend with music friends. December is a wonderful month on Jekyll Island. Mary Z. Cox & Jim Crozier play banjo/bass duets, vocals, guitar, uke--mountain music gone coastal & then some for Habitat For Humanities' Festival of Trees. Two time Florida Banjo Champion and recording artist, Mary Z. Cox , with Jim Crozier bring banjo, guitar, uke, bass and vocals to the Root Cellar on Friday Nov 7th , 6-10 pm. There will be West Virginia tunes, North Carolina tunes, Florida tunes, blues, banjo/ bass duets, songs of heartbreak, love and anti-love and THERE WILL BE BANJOS ! Two time Florida Banjo Champion and recording artist, Mary Z. Cox , with Jim Crozier bring banjo, guitar, uke, bass and vocals to the Root Cellar on Friday Nov 7th 8-10 pm. There will be West Virginia tunes, North Carolina tunes, Florida tunes, blues, banjo/ bass duets, songs of love & heartbreak and THERE WILL BE BANJOS ! Please join us at the Cashiers Library with Mary Z. Cox for a Thursday evening of banjos, song & camaraderie . 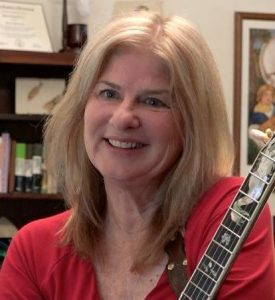 Two time Florida Banjo Champion, mountain dulcimer and recording artist, Mary Z. Cox , will be bringing mountain dulcimer, clawhammer banjo and frailing guitar & singing to the Pickin Porch Saturday July 19th. There will be West Virginia tunes, North Carolina tunes, Florida tunes, blues, songs of heartbreak, love and anti-love. We're gonna laugh, cry, sing, maybe even yoga--and THERE WILL BE BANJO ! “Banjo with mountain dulcimer". Learn the techniques and style of playing old time frailing banjo in a string band with a dulcimer. We'll learn D fiddle tunes that play well on both instruments, and give tips on how to integrate them for successful duet or string band playing. Ideal for banjoists who can already play several tunes with a steady beat. Please come tunes in double D (aDADE) or double C with a capo on the fifth string. See & hear special banjos & dulcimers from the private collection of recording artist, Mary Z. Cox. Mary’s version of “Sally In the Garden” will be in the soundtrack of a upcoming film in the Hunger Games series, and her cds & recordings have been played on National Public Radio’s Thistle and Shamrock, All Songs Considered, BBC, & Pandora Radio and World Music Genome. Mary Z is a two time Florida banjo champion and six time mountain dulcimer champion, and has taught banjo & mountain dulcimer workshops from coast to coast and has been an instructor at the John C. Campbell Folk School for the last decade. This promises to be a fun and special evening to meet Mary Z. and see and hear a few of her banjos and dulcimers up close at the Cashiers Library. Clawhammer banjo for intermediate & advanced pickers. Learn some new tunes in double D, easy drop thumb exercises, we’ll play up the neck a bit, learn an easy duet, maybe even try a banjo waltz. If you can already play a few steady tunes—this will be great fun. Come tuned in double D tuning aDADE or double C with a capo. See & hear special banjos from the private collection of two time Florida banjo champion & recording artist, Mary Z. Cox when she brings her Banjo Sampler to the Earl Scruggs Center on Friday, July 11 from 7-8 pm. Hear a cello banjo, John Bowlin 1865 fretless banjo, gourd banjo, cigar box banjo, John Hartford banjo, mermaid banjo & maybe a surprise banjo. Learn a little banjo history and hear some early and modern old time frailing and claw hammer banjo. MaryZ won 1st place in the old time banjo contest in Brevard, NC last October playing Snowdrop in 35 degree weather outdoors , but you'll get to hear it indoors. Hope you join us for this special evening of music and fun—and—THERE WILL BE BANJOS ! MaryZ won 1st place in the old time banjo contest in Brevard, NC last October playing Snowdrop in 35 degree weather outdoors , but you'll get to hear it indoors. Hope you join us for this special evening of music and fun—and—THERE WILL BE BANJOS ! And--there are banjo workshops on Saturday too ! Bob & I will be playing the Florida Folk Festival, May 23-25, 2014. Two time Florida Banjo Champion and recording artist, Mary Z. Cox , with Jim Crozier & Ellen Sheppard bring banjos, guitars, mandolin, bass and vocals to the Mockingbird stage on Thursday, May 1st. There will be West Virginia tunes, North Carolina tunes, Florida tunes, blues, banjo/ bass duets, mandolin madness, songs of heartbreak, love and anti-love. We're gonna laugh, cry, sing, maybe even yoga--and THERE WILL BE BANJOS ! Hey--this will be twice in the new year that I'll be playing in an oyster shucking venue--the next one is on March 15th at Mission San Luis--but its a private engagement with a security guard and everything--you'll never get through the door without a written invite :) I'll be playing banjo with the "Aw Shucks String Band"
Contact the John C. Campbell Folk School for more details and to register! Festival as a Faculty Member. The festival will be held at Unicoi State Park Lodge in Helen, Georgia, from November 21st through 24th. This is a very fun festival and the location is top notch. I'll be performing one evening too. Dulcimer classes and performance times TBA. Bob & I will be playing Friday evening for the Preview Reception of the Festival of Trees from 7:00-7:45 PM. TBA--this will be an hour talk and demo with music and banjos--maybe even dulcimers. Will update with exact program soon. Last year, it was a banjo/dulcimer sampler and the auditorium was packed with folks standing in the hall. This is a very fun evening and you are bound to see and hear some really fine instruments if you come. Come join us at the 61st annual Florida Folk Festival on Memorial Day weekend, 2013 ! This will be a fun workshop for intermediate banjoists from April 7-12 in 2013! Please join us at the Cracker Coffee House on February 2, 2013. It's February birthday celebration time, Groundhog Day & Mardi Gras all rolled into one . It's in the Stephen Foster State Park auditorium in White Springs, Florida ! Bob & Mary Z Cox will play a 45 minute set of banjo & guitar for the Big Bend Habitat For Humanity's festival of trees. Many top local music groups will be playing for your entertainment at this fine event. Come out and hear some good music while shopping for a designer Christmas tree for your home. Bob and I will be visiting the Cradle of Forestry and will be the guest performers for their music series. Sunday afternoon on JUly 15, 2012. Dr. Keith Holland will speak about the discovery and excavation of the Maple Leaf ship that sank during the Civil War in the St. Johns River. Mary and Bob Cox will entertain with old-time folk music, and food will be catered for a fee by Tropical Smoothie. 5:00 to 8:00 p.m. Program is at 7:00 p.m. Program and parking are free. Mary Z will be teaching 2 mountain dulcimer and 2 clawhammer banjo workshops. Bob and Mary Z will be leading a jam, performing, and we will have our vending table too--so please come by and visit. This is a very fun weekend right near the Mississippi River. Check out the website for updates and more details. Bob and I have signed up for Scottish Heritage Week at the John C. Campbell Folkschool the week of September 4-10 2011. I will use my instructor voucher for either singing or quilting class and Bob will be taking the cooking class. My first Scots ancestor to come to America was Charles Peck Thompson--who arrived in the 1700s--and made his way west from the East coast to settle in West Virginia. July 17-22--Bob and I will be vending at the Western Carolina Mountain Dulcimer Week this year. I'll be giving a "Dulcimers In History" talk/demo on a couple afternoons and Bob and I will be giving a couple "intimate concerts" on a couple of the evenings. If you are going--please come to our talks and shows. As soon as I know the exact times and days--I'll put them up. Bob and I will be playing at the 59th Florida Folk Festival on Memorial Day Weekend, May 27-29 2011. Bob and I will have a vending table at the Lagniappe Fete and will have our cds and books available. Ellen and I attended last year and had a wonderful time vending and we led a jam. This is a fun festival with lots of jamming and informal as well as formal events--so if you're attending--please stop by and see us at our table and pick a tune or two. If you will be playing--please remember to sign up by 6:45 PM with Larry Hoover. Bob and I will be at Unicoi vending and jamming on Novemeber 19 and 20 this fall. Please stop by our booth to hear our new CD and check out Mary's new "Easy String Band Method for the Mountain Dulcimer" book/cd and play a tune or two. Be A Banjo Star: Continuing Clawhammer Banjo November 14-19, 2010 Expand your repertoire of banjo tunes, while improving your technique and tone. We'll explore tunings beyond basic G, begin drop thumbing, and play together as a class to steady right hand rhythms and practice simple chordal back up. This is going to be great fun--the food and facilites are awesome at Campbell--and it will be a week of fun and banjo!) Contact John C. Campbell Folk School for free color catalog and registration. Date: Friday and Saturday, November 12 and 13, 2010. Stephen Foster Folk Culture Center State Park will host the Stephen Foster State Park Dulcimer Retreat on November 12 and 13, 2010. This event invites participants to a weekend of fun and fellowship along with workshops, jam sessions and evening concerts. The Stephen Foster State Park Dulcimer Retreat will be hosted by dulcimer master David Beede, who was most recently a featured performer at the 58th Annual Florida Folk Festival. The retreat will offer in-depth instruction and techniques on the mountain dulcimer, hammered dulcimer and autoharp musical instruments. Traditional music is celebrated with workshops offered for beginning, intermediate and advanced students, taught by nationally recognized instructors. Concerts featuring masterful instructors from the workshops are scheduled for Friday and Saturday evenings in the park auditorium at 7:00 p.m. Tickets for public admission are $10.00. Admission to the two day event is $85.00, which includes all workshops, jam sessions, concerts and discussion groups. After October 29, there is a $15.00 late registration fee. For more information on the Stephen Foster State Park Dulcimer Retreat, call (386) 397-7009 or toll free 1-877-635-3655. Fees: $85.00 includes all Workshops, Concerts, Jams, Seminars and Discussion Groups. Contact: For more information, call 386-397-4478. Directions: Located on U.S. 41 in White Springs. From I-75 to S.R. 136 (Milepost Exit 439 - Old Exit 84), travel east on S.R. 136 for 3 miles. Turn left on U.S. 41. Park entrance is on the left. From I-10 to U.S. 41 North (Milepost Exit 301 - Old Exit 43), travel 9 miles to White Springs. Park entrance is on the left. Please join us Thursday, October 21 at 7 pm, when Mary Z. Cox brings mountain dulcimers from her collection to Cashiers with a talk and demonstration on the history of the mountain dulcimer. Hear the magical Peruvian Red Simmerman and the wine barrel dulcimette (recently played on NPR's Thistle and Shamrock program) and more. Uncle Dave Macon Days National Championship for Ole Time Banjo, Buckdance, & Clogging. Bob and I will be playing banjo and guitar instrumentals from 4:30-6:00 PM. Dust off your hats and read up on the horses, Derby Party 2010 is racing your way on Saturday, May 1 from 4:30 – 10:30 pm at the Uno Hill Barn at Pebble Hill. The Derby Fundraiser is open to both Members and non-members. Derby Committee Co-chairs are Jill Carraway and Bunny Byrne. This year's theme is "My Old Kentucky Home." As Landmarks' only major fundraiser, the success of this event helps determine what projects we will be able to undertake in support of our mission in the community. Member invitations are in the mail. You may also purchase tickets online by clicking here. Individual Tickets are $50 per person and include dinner, non-alcoholic beverages, dancing and Derby activities. Unlimited Bar Drink Armbands (for beer, wine and mint juleps) are available for $15 per person. Stephen Foster Folk Culture Center State Park will host the Suwannee Dulcimer Retreat on November 13 and 14. This event invites participants to a weekend of fun and fellowship along with workshops, jam sessions and evening concerts. The Suwannee Dulcimer Retreat offers in-depth instruction and techniques on the mountain dulcimer, hammered dulcimer and autoharp musical instruments. Traditional music is celebrated with workshops offered for beginning, intermediate and advanced students, taught by nationally recognized instructors. Bing Futch, Mary Z. Cox, Susan Boyer Haley, Aaron O’Rourke and retreat director David Beede. The Suwannee Dulcimer Retreat also welcomes performing national performing artist Christie Burns and Florida’s own Ray Belanger for instruction on the hammered dulcimer. The autoharp instructors are performer Ivan Stiles and Tampa’s own Cheryl Belanger. Concerts featuring these masterful instructors are scheduled for Friday and Saturday evenings in the park auditorium at 7:00 p.m. Tickets for public admission are $10.00. Admission to the two-day event is $85.00, which includes all workshops, jam sessions, concerts and discussion groups. Registration is now open and forms are available at Dulcimer Registration Form. After October 30, there is a $15.00 late registration fee. For more information on the Suwannee Dulcimer Retreat, please call Morris Cook at (386) 397-7005 or toll free 1-877-635-3655. Call Reserve America at 1-800-326-3521 to reserve a camping space. Fees: Tickets for public admission are $10.00. Admission to the two-day event is $85.00, which includes all workshops, jam sessions, concerts and discussion groups. Contact: For more information, call 386-397-7005. Jim and I will play a couple banjo/bass duets at the beginning of the second set--about 9:30 PM. Although Jim and I played some duets on my Florida Banjo CD--this will be the first time we have ever played together live and in public! Be surprised at how wonderful bass and banjo go together. :) The next Jim Crozier Band Show will take place at the American Legion Hall, Lake Ella, on Friday, June 26. We bring out Alvin James and the Pretty Big Band with help from the Jones Brothers, the Summit Ladies Choir, and the Bone Dry Band. Be A Banjo Star: Continuing Clawhammer Banjo April 12-17 2009 Expand your repertoire of banjo tunes, while improving your technique and tone. We'll explore tunings beyond basic G, begin drop thumbing, and play together as a class to steady right hand rhythms and practice simple chordal back up. This is going to be great fun--the food and facilites are awesome at Campbell--and it will be a week of fun and banjo!) Contact John C. Campbell Folk School for free color catalog and registration. Come experience and enjoy the Suwannee Dulcimer Retreat on November 14th and 15th, 2008 at the Stephen Foster Folk Culture Center State Park in historic White Springs, Florida. The weekend offers workshop sessions taught by foremost mountain, hammer dulcimer and autoharp players from throughout the United States. In addition, there will be concerts on Friday and Saturday evenings at 7:00 p.m. that will feature your favorite musicians. This year’s Mountain Dulcimer instructors include: Butch Ross, Bing Futch, Mary Z. Cox, Susan Boyer Haley, Aaron O’Rourke and David Beede. Hammered Dulcimer instructors include National performing artist Dan Landrum and Florida’s own Ray Belanger. Our Autoharp instructors are Nashville songwriter and performer Will Smith and our own Cheryl Belanger. The entire retreat costs $85.00, which includes entrance to both Friday and Saturday concerts and workshops. Evening concerts are open to the public for a fee of $10.00. Fees: $85.00 includes all Workshops, Concerts, Jams, Seminars and Discussion Groups. Contact: For more information, call 386-397-4478. Mary Z. & Bob Cox Porch Pickin"
Clawhammer Banjo Workshop/Mary Z. Cox Judy Muldawer's home inquiry@siliconheights.com Creeping up the Banjo Neck (Intermediate) Begin to play tunes up the neck in Double C. Get your fingers used to creeping past the 5th fret without music theory or stress! We´ll use this technique to learn Sally Ann, John Stinson´s #2 and Angeline. Come tuned in gCGCD. Add sparkle to your playing while having lots of fun. 6:30-8:30 PM workshop 8:30-9:30--stay and jam awhile with Bob and Mary. Register with Judy in advance and get a $5.00 gift certificate good towards any of Mary's CDs, Books, or T-shirts that evening. Please join us for an evening of music and song in beautiful Albuquerque, NM. We choose our favorite traditional tunes and combine them with a stage show that features Mary Z's banjoholic and dulcermaniac activities for an entertaining acoustic concert suitable for all ages. :) Albuquerque's own "Hands Five" will be opening the show at 7:00 PM and we'll begin at 7:30 PM. We've heard the Southwest Pickers really know how to have a good time--so please come out for a fun evening. :) Check with Judy Muldawer for more details. Old Time Banjo Workshop - 2-5 PM Creeping up the Banjo Neck (Intermediate) Begin to play tunes up the neck in Double C. Get your fingers used to creeping past the 5th fret without music theory or stress! We´ll use this technique to learn Sally Ann, John Stinson´s #2 and Angeline. Come tuned in gCGCD. Add sparkle to your playing while having lots of fun! And we'll continue with "Snow Drop" in open C which is a fun tune--even if you've played for years! Snowdrop has become a popular contest tune on the East Coast and it is one of my most requested tunes for banjo workshops. Limited to 20 students. Mary Z. & Bob Cox at Florida Folk Festival 2008 Date: May 23rd through May 25th, 2008. Gates open at 8:00 a.m. Description: Enjoy the diversity of Florida´s culture and history when its residents share their food, music, dance, stories, crafts and work life. Visit Seminole family camp, watch the state fiddling contest and savor ethnic food and church supper favorites. Pets are not allowed. Send check and self-addressed, stamped envelope to: The Will McLean Foundation 2023 Palmetto Lane, Dunnellon, FL 34432 Phone: (352) 465-7208. (Order Tickets Online) ADMISSION BEFORE MARCH 2 $25 Weekend advance ticket $25 At gate: $30 Sat. $18 Sun. $15 Children under 12 free Camping hookup: $15.00 per night. Rough camping: $10.00. First come, first served. Spend a weekend camping and listening to great Florida Music,or come for a beautiful day! FIRST SATURDAY COFFEEHOUSE Bob & I will be hosting the February Coffee House again in February. We celebrate all month February in Tallahassee and hope you'll join us in White Springs for some wonderful entertainment and a celebration of all February birthdayers! If you'd like to perform--please sign up with Larry Hoover in the auditorium by 6:45 PM. Last year--we had awesome performers from California to the Outer Banks of NC and many places in between. And--MaryZ usually celebrates her birthday by bringing her own chocolate cake to share with the audience and performers! Hope you can come--it is a really fun evening! Date: Saturday, February 2, 2008. 7:00 p.m. Description: Songs, stories, music or poetry may be performed at this open stage night held in the park auditorium. Coffee and desserts available for sale. Fees: This event is free! Contact: For more information, call 386-397-4331. Contact Linda Ives for details. River City Dulcimers and Friends/ St. Paul United Mehodist Church and Bruce Ford are hosting our Jax concert. Mary Z. & Bob Cox on old time banjo, mountian dulcimer and guitar. :) Contact Bruce at: bwf@everythingdulcimer.com for full details. Come early for River City Dulcimers welcoming tunes! Hope to see you there! Mary Z.& Bob Cox (workshops and concert) March 9, 10, 11--2007 March 12th is Bob's Birthday! December 1-2 2006 More details coming soon. November 17-20, 2005 - NGFDA Fall Festival - Helen, GA More details soon. November 4-5 - 30th Annual Fall Country Jamboree Come celebrate with us during this two-day festival - our most popular event of the year! Florida pioneer life is demonstrated through the folk arts, lifestyles and early industries. More than 100 artisans and craftsmen. Activities for adults and children. Florida musicians and storytellers provide continuous performances. Juried arts and crafts show. Corn boil, BBQ, Fish fry, Bean soup and more Florida Cracker foods for sale. Free parking and shuttle service from nearby lots. Saturday 9am - 5pm. Sunday 9am - 4pm. Admission: Adults $5.00. Children 16 and under FREE! Direct from Tallahassee, Florida, the Crimson Moon features banjo and dulcimer player Mary Z. Cox, accompanied by her husband, Bob, on guitar, and Jezebel the basset hound. (the canine metronone) While we often think of the banjo as an integral part of a bluegrass band, in Mary's hands, it deserves to be up front and center. In the liner notes from her most recent album, "A Secret Life of Banjo", she talks about how in jam sessions and old time dances, the keys and tunes are chosen to fit the repertoire of the fiddler and the rhythm of the dance. But when she plays on her own, she can slip into tunings that take advantage of all of the versatility of the banjo. She goes on to say, "I believe the banjo has a unique voice when played by itself that is lost in a group session." At this show, you will hear both the fine solo banjo and the wonderful interplay of the banjo and Bob's excellent guitar work. You will also hear them play some exquisite mountain dulcimer/guitar duets that range from the haunting "Cold Rain and Snow" to the exotic "Spanish Fandango." She selects an outstanding assortment of songs and tunes. Old Time Banjo Duet Workshop Learn the melody and a harmony to James Bland's 1879 banjo tune, "Golden Slippers." For double the fun, bring a banjo buddy and learn together. Just right for novice/intermediate level and up banjo players. Come already tuned in: gCGCD. (2 hour workshop) If you can play a couple tunes and read simple tab or play by ear--you can do this! Florida Festival celebrating the music of Will McLean and Florida. The Will McLean Foundation P.O.Box 3435, Dunnellon, FL 34430-3435 Phone: (352) 465-7208. Look for Mary Z. and Bob Cox demonstrating clawhammer banjo, Appalachian dulcimer, and guitar on a porch in the Folk Life Cabin area between 10-4. This is the kick off event for the Park's craft and music demostrators at Stephen Foster. Hope to see you there!